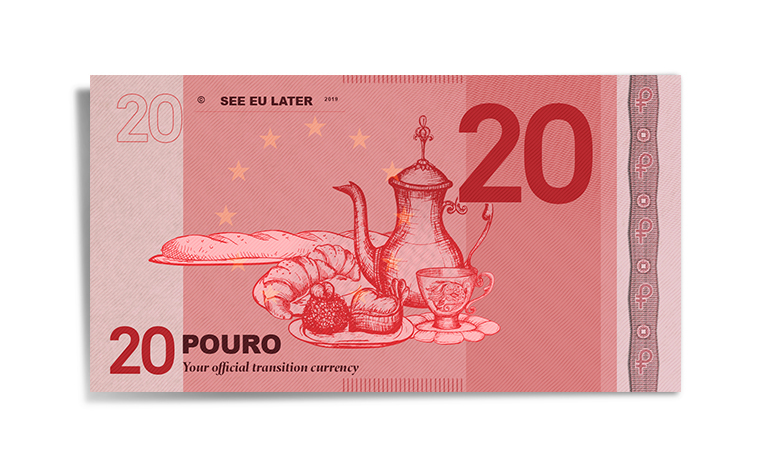 Introducing the Pouro, the official transition period currency. But first, a little background info. Brexit, or the withdrawal of the United Kingdom from the European Union, has plagued global media outlets for over two years now. Who would have thought a little old thing like leaving the EU, the single market and a customs union would cause such a fuss...? As the UK and the rest of the world come to terms with the fact that Brexit and the almighty amount of confusion that surrounds it will linger for quite a while longer, we thought it was best to do something to deplete some of the angst. While the British Government and MPs have been bickering amongst themselves, Travel Money Oz has listened to what the people want. We get it, you are confused and angry. How will Brexit effect your summer jaunt to Europe? Will your plans of rooftop cocktails in London, sunbaking in Greece and pastry eating in Paris be hindered by Brexit? Most of all, how will Brexit effect the value of our trusty Aussie dollar? You: I’m heading to Italy in May. Does Brexit mean I’ll get more or fewer euros when exchanging them for AUD? We decided to take matters into our own hands and create a whole new currency for you to use while the UK and EU sort themselves out. This nifty little number is here so you can say “see EU later, euro” and be rid of that Great British pounding headache. Ready for use throughout the transition period, the pouro will be accepted throughout the United Kingdom and Europe.. That’s right, folks, one currency to exchange and carry across 27 countries in Europe and four countries in the UK. Just like tacos and Brexit, you can get soft and hard versions of the pouro. Hard being the 1 and 2 pouro coins, soft being the 10, 20, 50, 100 and 2903 pouro notes. Designs for the 20 and 50 pouro notes have already been released. They depict the perfect mishmash of what makes the EU and UK great. Just like the Canadian dollar smells of maple, the Aussie dollar is known to reek of VB, and you'll get the occasional waft of hot dog from the USD, the pouro smells of fresh croissants and an English breakfast tea. You may also detect subtle undertones of confusion and disappointment, which have been universal emotions throughout the entire Brexit ordeal. The pouro is a blend of cotton fibre and paper. The paper itself is recycled from the ballots sheets used for the original referendum, as well as the multiple 'meaningful votes' and 'indicative votes' held in the UK Parliament. The 10 pouro note is purposely soft, ready to be used as a tissue to wipe your tears of frustration in the border security line at the airport. If you piled up all of the pouro coins that have been created, it would build a bridge from the UK to Paris for those who don't, in fact, want to leave the EU. The largest denomination available is 2903 pouros. An odd number, however, it commemorates the original Brexit date and is probably indicative of the year the whole thing will actually get sorted. Members of the UK Parliament are still bickering about the design of the bills, hoping to somehow include a picture of a corgi on the 50 pouro note. This argument is futile, considering the EU has already stated there will be no more amendments to the note design, even if it is the inclusion of a fluffy little bundle of joy. There are rumours that there will be a commemorative 'divorce bill' pouro. Its value will be uncertain and will change depending on who is holding it, reminiscent of the Brexit divorce bill. 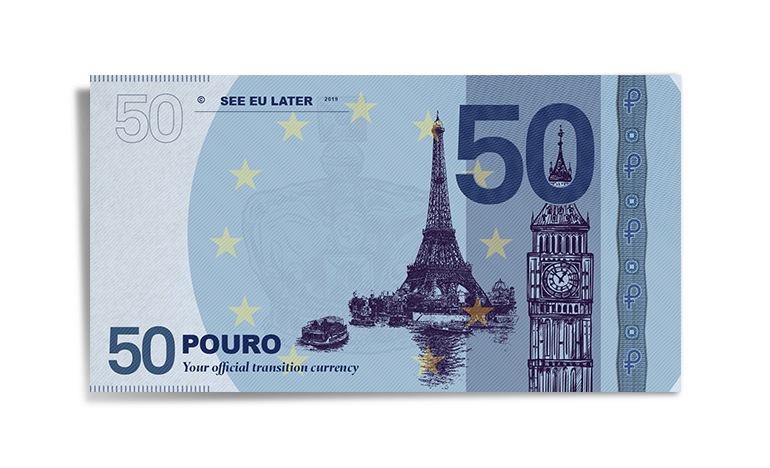 A limited number of pouro notes will be available on Monday from your local Travel Money Oz. Get it quick before the illustrious smell wears off the notes. Trust us, EU’ll love it. This blog is for satire purposes only and is not a reflection of actual market movements. The pouro is a fictional currency created by Travel Money Oz for the purpose of this article and is not actually available for purchase (we really wish it was though). You should consider whether the information and suggestions contained in any blog entry are appropriate for you, having regard to your own objectives, financial situation and needs. While we take reasonable care in providing the blog, we give no warranties or representations that it is complete or accurate, or is appropriate for you. We are not liable for any loss caused, whether due to negligence or otherwise, arising from the use of, or reliance on, the information and/or suggestions contained in this blog. All rates are quoted are market rate and may not be available to the general public.